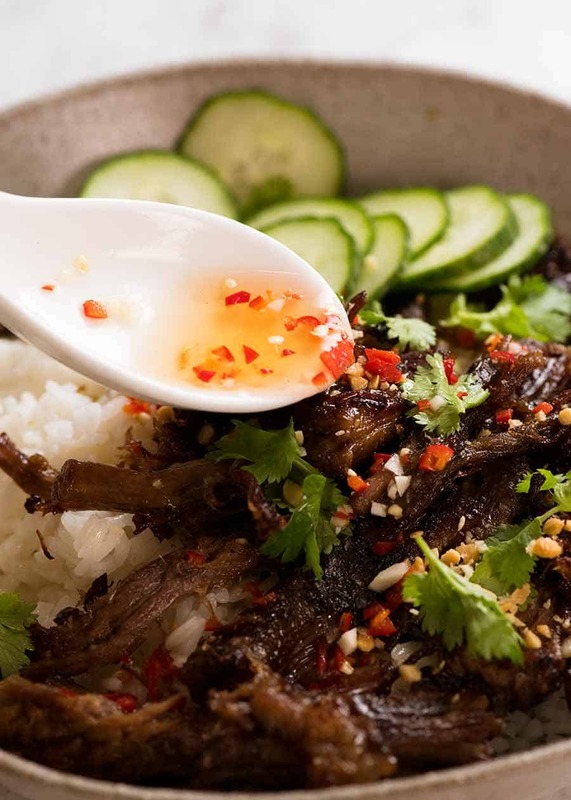 Caramelised Vietnamese Shredded Beef encompasses all that we love about Vietnamese food! 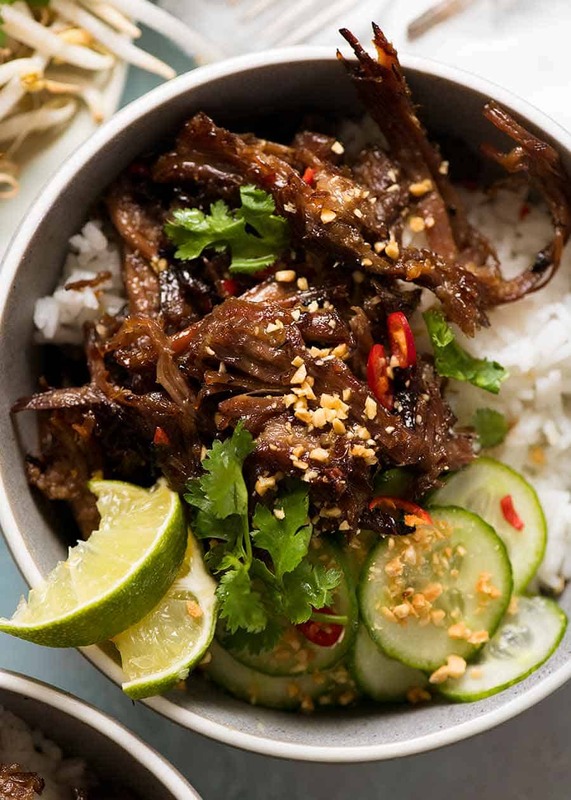 Shredded beef tossed in a lemongrass sauce then pan fried until golden, it’s savoury, sweet and garlicky. But let’s be honest. It’s those crispy golden bits that we go bonkers over! This is a quick recipe that evolved to use up leftover cooked beef, such as after making stock. So I’ve used repurposed beef here but don’t worry, it can be made from scratch too! 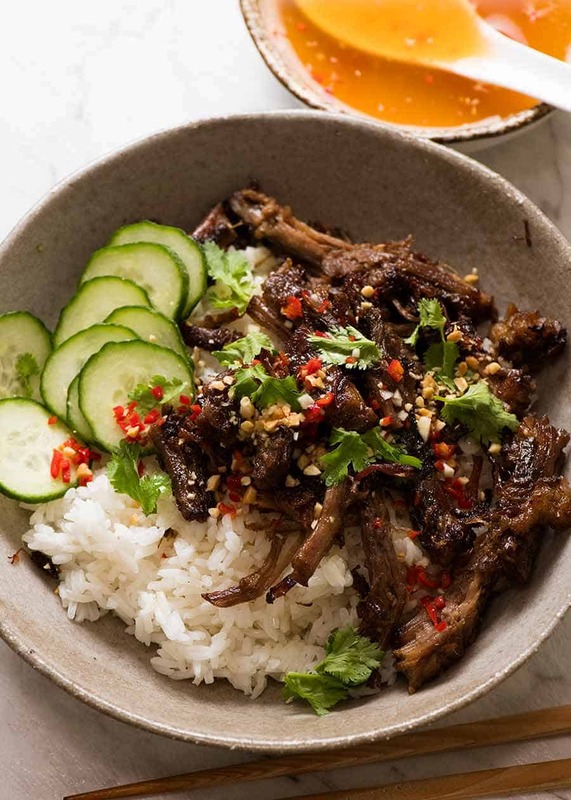 Caramelised Vietnamese Shredded Beef is a recipe that was born as a way to use up leftover cooked brisket used to make the broth for Pho soup. Leading up to publishing the recipe, I made it quite a few times and found myself with an alarming stockpile of cooked brisket in my freezer. Very easy to give away Pho take-home packs. Doesn’t sound very appetising does it?! So what do we do? We just inject a ton of Vietnamese flavours, then give it an extra wow factor by pan frying to get all those crispy golden bits! Don’t worry if you happen not to have leftover cooked beef in your fridge. It’s VERY simple to make this from scratch. 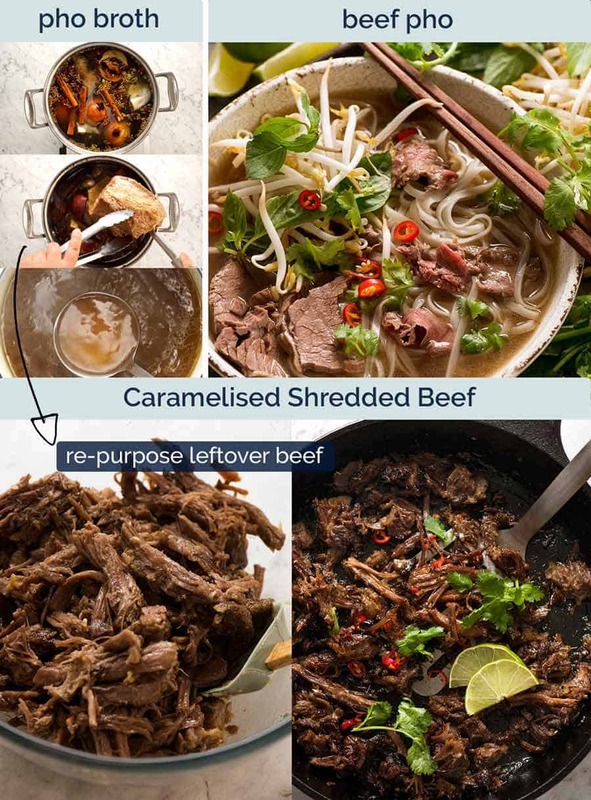 This Caramelised Vietnamese Shredded Beef recipe is ideal to use with leftover beef picked off meaty bones when making broth, or large pieces of meat like brisket used in Pho or similar where the beef meat has been simmered for hours so the beef flavour leeches into the broth. It can also be made with any type of cooked beef – it doesn’t even need to be shreddable – as long as it’s relatively neutral OR Asian flavoured so the Lemongrass Sauce flavour doesn’t clash. The idea with this recipe is to repurpose beef scraps after making stock and to transform it into something amazing! Just simmer raw brisket or chuck for 2.5 – 3 hours with a few basic flavourings (onion, garlic) until it’s shreddable. We don’t need to add flavour to the beef when braising because the Lemongrass Marinade does that job. But by adding some basic flavour into the braising liquid, you will be able to use that broth for another purpose (anything that calls for beef broth!). 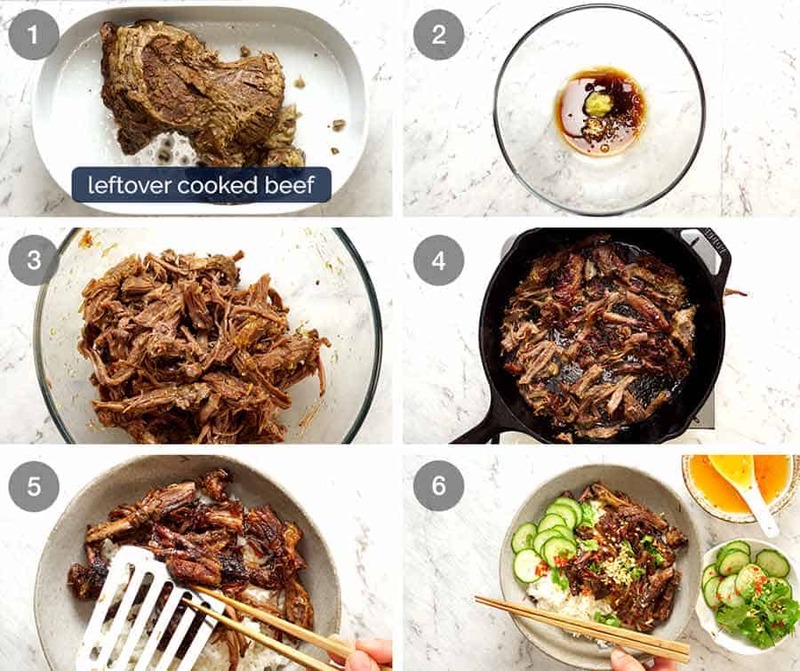 The flavour added to the beef is my “go-to” Vietnamese marinade recipe. I use it to marinate whole pieces of chicken (thigh, breast, wings, drumsticks) which I serve as is, or make Vietnamese Chicken Noodle Bowls. I marinate and grill or bake chicken wings, pork chops, tofu (yes really! ), or prawns/shrimp (try this Vietnamese Shrimp Salad). If you serve it hot off the stove then I think you’ll find you need nothing more than perhaps a quick squeeze of lime to finish it off, and a big dollop of chilli sauce or paste wouldn’t go astray either. However! If you want to really go all out, make up some Nuoc Cham, the chilli-garlic-fish sauce-lime sauce that is served with everything in Vietnam. And that’s no exaggeration! There’s tons of variations, from lighter flavours so it’s used almost like a soup such as with Bun Cha (Vietnamese Meatballs), to stronger sauces used for dipping Vietnamese Rice Paper Rolls. Use the Nuoc Cham dipping sauce in this Vietnamese Lemongrass Chicken recipe, it’s the version best suited for this Caramelised Vietnamese Shredded Beef. 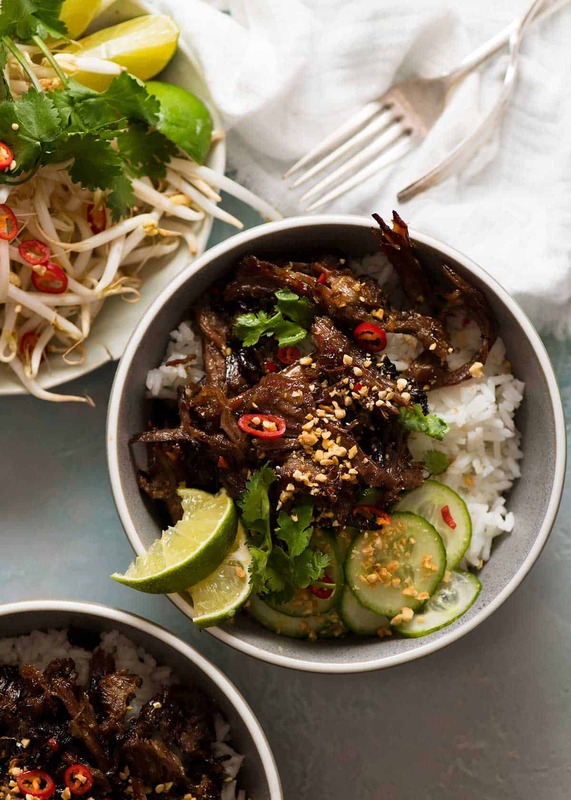 If you make this Caramelised Vietnamese Shredded Beef to use up the beef after making Pho, you’ll love how the toppings and sides are basically the same ingredients! Lime wedges, a big pile of bean sprouts, fresh herbs (coriander/cilantro is ideal, Thai basil also fantastic, mint also great – or a combo of these). A little fresh chilli if you can handle the heat and for some extra bedazzle, a little sprinkle of peanuts. PS I’ve made this using leftover chicken too, such as after making homemade Chicken Noodle Soup from Scratch. It’s really terrific! Just use a touch extra oil. Recipe video above. A very quick, very tasty way to use up leftover cooked beef used in things like broth (see notes to start from raw). Created to use up leftover brisket from making Vietnamese Pho. Cooked is tossed in a Vietnamese lemongrass marinade then pan fried until golden. It’s INSANELY delicious! Mix Marinade in a bowl. Add shredded beef and mix. Set aside 5 minutes. Heat oil in a large skillet over high heat. Add about half the beef and spread out in single layer. Leave undisturbed until golden (about 1 minute). Flip then cook the other side just briefly (about 30 seconds) just to heat and get a touch of golden, then remove. Place 800g/1.6lb brisket in pot with 2 smashed garlic cloves, 3 slices ginger, 1 onion cut into quarters. Just cover with water. Cover then simmer for 3 hours (or slow cooker 10 hours low, pressure cooked 1 hr 20 min high) or until brisket is easily shreddable, then use per this recipe (will shrink down to about 500g/1lb). Reserve braising liquid for use as broth for Asiany recipes, reduce down as needed to get sufficient strength (I’d expect to get 2 – 3 cups out of that much brisket). Try this Chinese Noodle Soup, Wonton Soup, Hot and Sour Soup or add in some of the spices from the Pho recipe and make a simple Pho! Or use in place of water in any Stir Fry or Stir Fried Noodles recipe for extra amazingness. 2. Lemongrass paste – I use this for convenience, could also use 1 thick lemongrass stalk, very finely minced. 3. Sauce – Sizzling straight off the pan, it’s so juicy that you won’t need a sauce other than a squeeze of lemon juice. But if you want to douse everything in your bowl with a sauce, use Nuoc Cham, the garlic/chilli/lime/fish sauce sauce that is served with everything in Vietnamese cuisine! Use the Nuoc Cham sauce in this Lemongrass Chicken Noodle Bowl recipe. Currently on a mini break with Dozer at Rick Stein’s Bannisters Hotel in Port Stephens! 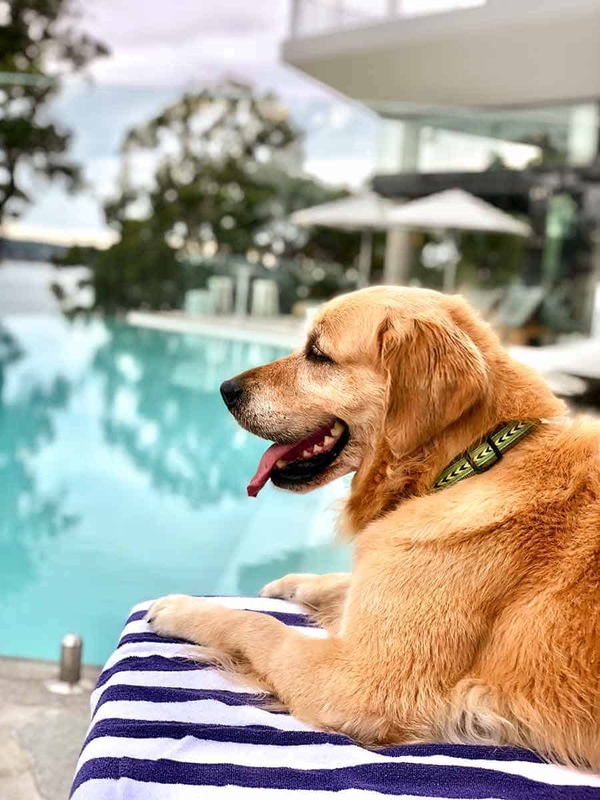 Finally – a great dog friendly hotel!! 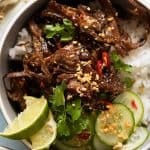 The post Caramelised Vietnamese Shredded Beef appeared first on RecipeTin Eats.